With my new kitbashes of some Russian Spetsnaz figures, one thing that has shocked me is the loose parts price of the DAM and KGB Hobby weapons, especially the AK-74 rifles. 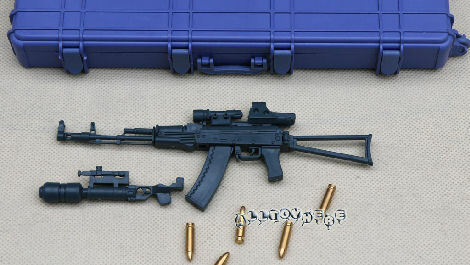 And after mentioning it to some other modellers, I was pointed to the 4D AK-74 model puzzle which is made in 1/6th scale. And with a little bit of work, they can be made presentable to be used with 1/6th figures. Two very good reviews of the various sets made by 4D are here and here, I also found out about a page on the bbicn website. Where they have had some excellent looking results with repainting these models. 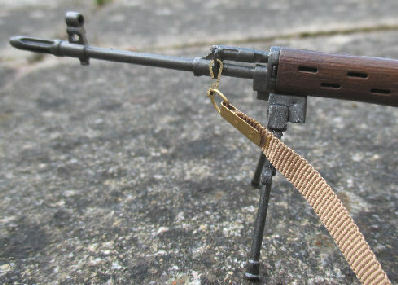 For my figure I bought the AK74 model, and I have re-painted it as below. I have also used this method before on my KGB Hobby AK-74 rifle. 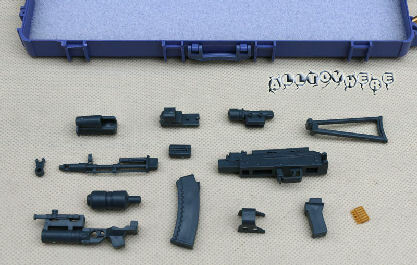 The model came assembled in Picture 1. in a plastic gun case, and as shown in Picture 2. it can be taken apart to the separate pieces. Which I found did help a lot with the painting and alterations I did. 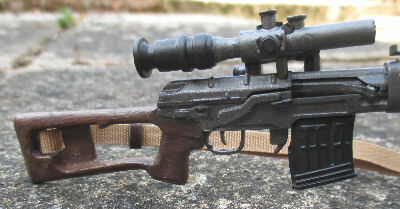 These pictures are of the altered rifle, in picture 3. I have cut off the solid moulded lug on the stock, and I have replaced it with a sling buckle made from a staple. I also made a hole in the other sling attachment point, so that I could use my needle files to remove the centre part of the solid moulded lug. The acrylic paints I used for this model were made by Citadel (Warhammer) Abaddon Black & Leadbelcher, the paints were mixed by adding a tiny drop of the Gunmetal paint to the Black. 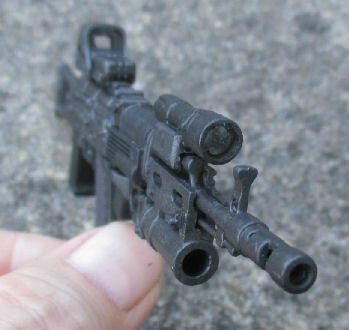 Then when dry I gave the rifle a wash of just the Black paint to add depth to the recesses. Then when dry I gave it a brush over with some Tamiya Gunmetal weathering powders, the purpose of this is to add highlights to the raised areas. I also gave what would be the Black plastic parts of the rifle, a drybrush of some Tamiya Coal Black weathering powder to dull these areas. 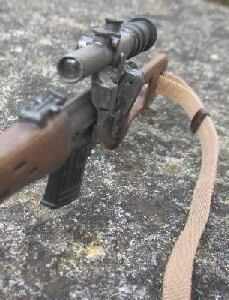 Picture 5. shows the sight on top of the rifle, into which I have cut two thin pieces of plastic to represent the lens of the sight. I first removed the top cover, then cut the plastic to a rough shape, glued them in place and when dry I sanded them to the final shape. Picture 6. shows the end of the flashlight, into which I have fitted a 5mm Clear lens which I found was a nice tight fit. The picture on the right shows the finished rifle with a sling added. Note: I am not bothered by the lack of detail on the trigger grip, as this will be hidden by the hand of my figure that will be holding it. 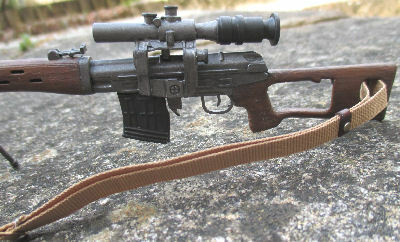 This is a 1/6th model of the Draganov SDV sniper's rifle made by 4D. And below are the photo's of my model after I have assembled and repainted it. The paint colours I used for the basic wood colour was Vallejo Model Color 143 Flat Earth & 183 Natural Wood, which I mixed together to get a wood colour. In all I think I repainted the wooden parts 3 times, with a slightly different shade of the mixed paint to get a colour that I was finally happy with. And once this was dry I then used some Cryla 223 Burnt Umber artist's acrylic paint, which I used almost dry straight from the tube to add a streaky dark grain to the wood. This was then gently blended in on the other paint with water to smooth the colour out. Below is the stock of the rifle with one end of the DAM rifle sling I used with this model, at the other end is a clip attached to a sling attachment point that I made from a staple. Which I glued into two holes I made in the rifle to secure it in place. These photos are of the metal parts of the rifle after I repainted it with some Games Workshop paint. The colour again was a combination of paint colours mixed together, such as acrylic Citadel Abaddon Black, Ironbreaker and Leadbelcher. I cannot remember what combination I used as again I repainted the parts twice, to get a colour I was finally happy with. 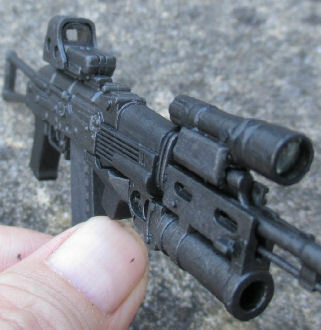 The back parts of the scope was just painted with the Citadel Abaddon Black paint, along with the top parts of what I think are the scope adjusters. 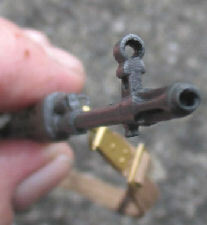 Once this was all dry, then gave the metal parts a wash of the Black paint, to add depth to the rifle parts. Before I gave the parts a drybrush of some Tamiya Gunmetal and Silver weathering powders to add highlights. The magazine was left unpainted, but I gave it a drybrush of some Tamiya Soot weathering powders to lose the plastic look it had. The photo on the right, shows where I have used my model knife which I twisted inside the end of the scope to enlarge it slightly. Before I fitted a 4mm Clear plastic lens into the end of the scope to represent the glass. I got the lens from this store - Little Cars. I also found that the fore sight and the end of the barrel were made solid, so I again used my model knife to twist and make a hole in these items. Which I enlarged slightly with a round needle file. I have had some advice given to me regarding the bipod on this rifle, because on the box picture the bipod is supposed to be fitted in front of the magazine. 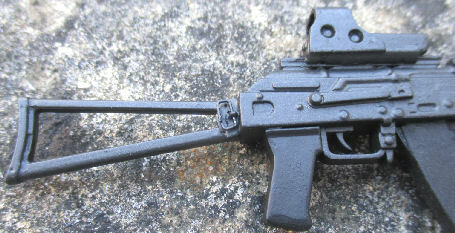 Instead of as displayed in the assembly instructions, where the bipod is fitted in Pictures 8. & 9. So rather than make a new bipod mount for this model, I have taken the easy option and I have removed the bipod mount, as well as the lug it fitted onto. 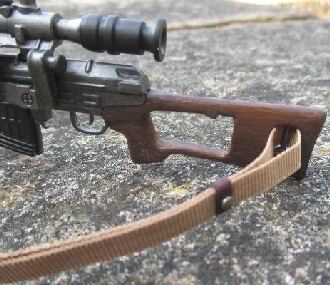 The two pictures below, show how after removing the lug I have had to reshape and also repaint some parts of the rifle.